Thanks to the response to a call out for landlords in the last Newsletter we are set to welcome two new families to the area shortly. We are still looking for landlords outside the East Hampshire District Council area so please do continue to spread the word. We are also actively looking for new volunteers to help get the new properties ready for arrival – see below for more details.As many of you already know Rosie Lennon is stepping down from her role as RRN CEO. Rosie kindly offered to take up this role for a year as to help cover Kaaren’s sabbatical and has done an excellent job as our first CEO. Rosie has a first class brain and a real passion to help and it’s been great to work with and learn from her. She’s been hands on with our families and volunteers, creating new ways of working and introducing RRN Open Meetings in Petersfield, which have been an excellent way of keeping us all connected and attracting new support. I’m very happy to say that Rosie will be staying on as an RRN Trustee so will continue to be very involved in RRN’s management and development. We’re hoping to say a proper thank you to Rosie later on this year. Kaaren Wallace, who’s continued to act as a Trustee whilst on sabbatical in Andorra, will be re-joining me as Co Chair from September. I’m very much looking forward to having her back. There are lots of exciting things happening at the moment – tomorrow evening, Tuesday 19th June there is a pop up gift shop from Roost and Raeburn in Petersfield where 10% of all sales will go to RRN, this Saturday sees the annual Family Fun Day from RRN and Winchester University, we’ve got our ‘Syrian Suppers’ month coming up in October and our Alex Rennie London Art Show in December. Please see below for further details on all upcoming events. Following the success of last year’s Family Fun Day, RRN joins Winchester University again to host a special afternoon at the University for refugee families settled in the region. We’ve invited families from across Hampshire and are expecting 50-70 people. Winchester University is again providing the venue and most of the support but it would be wonderful to have a few more volunteers from RRN. The afternoon starts at 2pm and there will be crafts and games for the children, tea, cake and sandwiches, massage and a tour of the University. All our families will be there as well as others from Lymington, Basingstoke and Chichester. If anyone would like to bake, we’d be most grateful for your contributions. After a quiet winter, the next few months will see a busy time as there are two properties becoming available, hopefully in the next month or so. We have a great team of volunteers, if you would like to be involved with a team and are looking for something practical you can do to help then maybe this is it. The Resettlement Team works alongside the Two Saints charity, local Government and other agencies to ensure houses identified by the Housing Team are prepared and ready for families arriving in the UK. This includes sourcing furniture and household items as needed, ensuring a first shop has been completed and preparing a meal for the family on their first day in their new home. Bringing it all together: arranging furniture in rooms, making beds, cleaning, unpacking the kitchen… everything to create a home. It’s a great team of enthusiastic, ordinary people, prepared to give up time and a little creativity to help transform a house into a home. Enthusiasm is the most important asset though a driving license/own car is very useful. We need volunteers to help RRN organise our ‘Syrian Suppers’ event which will take place during the month of October. We also need help with small local fundraising events. If you would like to volunteer or discuss this further please contact hello@ruralrefugeenetwork.org for more information. The next meeting Monday 24th September 2018 from 6.30pm at Winton House, 18 High Street Winton House, Petersfield, GU32 3JL. Please come along and join us. The Befrienders along with a brilliantly dedicated team of associated volunteers have been continuing to organise and facilitate social events for our families, providing venues, transport and organisation to offer the families a chance to get together in a relaxed environment.As well as the regular monthly social gatherings at Crossover in Liss, this month several of our families and volunteers were able to attend the Celebration of Syrian Music and Food which took place in Greatham as part of the Spirit of Music festival. Special thanks go to Amanda Todd for organising and co-ordinating RRN’s involvement in this event, and to Kay Summerfield for co-ordinating the food contributions from our Syrian friends. 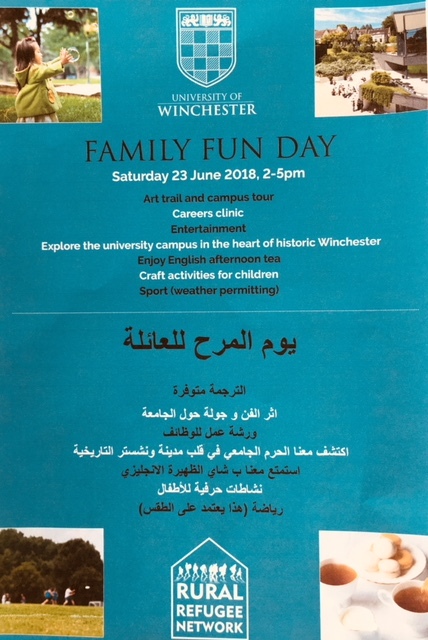 We are now looking forward to the Family Fun Day organised along with the University of Winchester on 23rd June. First of all, a big thank you to Kate Grocott, who has played a great role in our housing work to date. Kate is taking some time off, but we look forward to welcoming her back in the not too distant future. Thanks to Kate and the rest of the housing team we now have seven properties on stream, with two more, in East Hampshire, due to be handed over in July. We have also been able to pass on details of two homes in Devon to our contacts there. We now have quite a complement of houses in East Hants and Winchester, so will be looking to expand elsewhere in the County. Housing is of course the starting point for our work; without homes we cannot provide the welcome, support and all other services that mean so much. So please can everyone make an even greater effort to spread the word to every group of friends and colleagues you come into contact with. There can be few more ethical investments than housing for refugees. With the help of our Q&A sheet we can explain the facts to both landlords and anyone with a lump sum sitting in a bank doing nothing. Not that everyone is that fortunate, of course, but those who have downsized or inherited money are seeing the benefits of helping refugees in this way. There’s lots going on behind the scenes from the Fundraising Team, which includes the setting up of a community fundraising group. A huge thank you has to go to Kay Summerfield and her team who ran a hugely popular Syrian Food Stall, as part of the Spirit of Music Festival in May. From this event they raised £470, the donation of a house in Petersfield (although sadly EHDC has not been able to progress the offer) plus more volunteers. Thanks also to Sara for inviting us to your event. We have two community events that we will be supporting; St Peter’s Church Fete in Petersfield inSeptember and Blackmore Apple Tasting in October. Full details will be included in the next Newsletter. 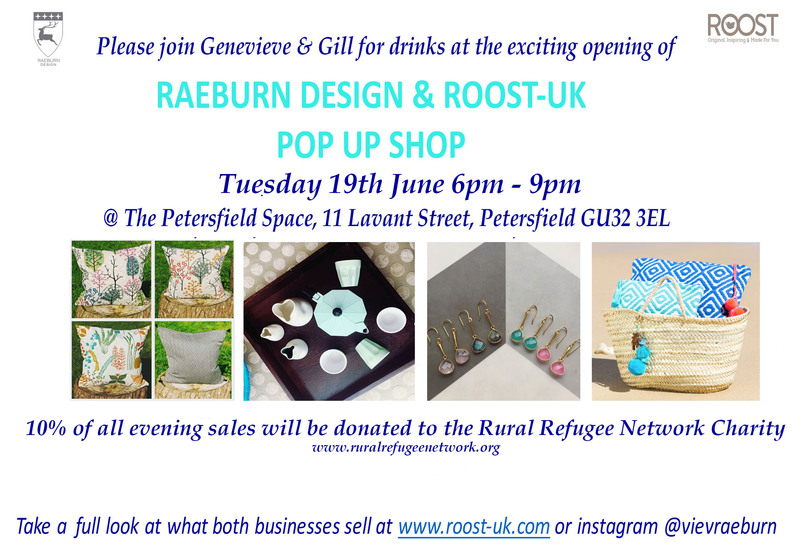 This month Genevieve Raeburn, who is part of the Fundraising Team, has a pop-up shop in Petersfield “Raeburn Design & Roost-UK” on Tuesday 19thJune at The Petersfield Space, 11 Lavant Street 6.00pm-9.00pm. Do go and support her on her opening evening as 10% of all proceeds is being donated to the RRN and Children on the Edge. October will be dedicated to a month of activity, whether is it organised events or fundraising in our own homes, all around raising money through serving food to friends and family and asking them to make a donation. You may remember that One Tree Books and Madeleine’s Kitchen ran a very successful event last year, where some of our refugees spoke; this was followed by a delicious meal in the shop. Other people hosted meals in their homes, all raising money for us through donations. Due to the success of our first year, we are planning on making it much bigger in 2018. So please do start thinking about who you would invite – it could be for tea and cake or you might want to do a full blown dinner! We are in the process of creating an information pack, which will be available to pick up or to download from the website. But we are also going to hold a major dinner towards the end of October and more details will follow. Many of you will know the name Alex Rennie from the two 33 Art Sales. He is a very popular artist, whose work has sold at both Art Shows. He is also hugely committed to the plight of refugees and after having been inspired by the work the RRN community does he has created a body of work in honour of refugees and those that welcome them. He is having a solo show in aid of RRN and our partner charity Children on the Edge in London on 3rd & 4th December at the Frestonian Gallery, Holland Park, London http://www.frestoniangallery.com/. 33% of the price of every piece of art sold will come to the Rural Refugee Network and Children on the Edge. We very much hope that you will be able to visit the show, and also bring friends and family who would be interested. As you know we are working in partnership with Children on the Edge. They run the Chichester Half Marathon, which takes place on Sunday 8th October. Please let them know you are doing this through the Rural Refugee Network, as they will set up a special Just Giving fundraising page for us. On May 9th Lord Alf Dubs hosted the launch of the Kindertransport Legacy Campaign at Parliament. I was privileged to attend this meeting where we heard stories from former Kinder children and their families, Barbara Winton (daughter of Kindertransport instigator Sir Nicholas Winton), refugee families, UNHCR and organisational representatives, faith leaders, and other members of Parliament. This year marks the 80th Anniversary of the Kindertansport which was an organised rescue effort that took place during the nine months prior to the outbreak of WWll. The UK took in nearly 10,000 predominantly Jewish children from Germany, Austria, Czechoslovakia, Poland and the Free City of Danzig. The children were placed in British foster homes, schools and farms. Often they were the only members of their families who survived the Holocaust. Lord Dubs was one of these children and has been a passionate campaigner for unaccompanied children since the outbreak of the Syrian war.We all left having made commitments to ask our Councils to find spaces for 10000 vulnerable refugee children. Britain’s departure from the EU means the UK will no longer be a signatory to Dublin III, losing a key legal mechanism through which unaccompanied children in Europe are able to join UK-based family members. Instead unaccompanied children in Europe will have to rely solely on the UK’s far more restrictive Immigration Rules in order to reach family in Britain. Lord Dubs tabled a successful amendment to the EU Withdrawal Bill in the Lords to ensure refugees still have access to this safe and legal route after Brexit. The amendment was won at report stage and we are writing to you now to ask for your support to ensure that Clause 12 remains part of the Bill and isn’t removed by the Commons. We have a battle on our hands to win over a majority in the House of Commons in order to get this amendment through. Every email to an MP counts. Please write to your MP and urge him/her to support Lords Dubs Amendment that seeks to include the Dublin agreement in the EU Withdrawal Bill to ensure that Britain will retain its commitment to refugee children to reunite with family here in the UK.